The use of complex multi-parameter equations of state in computational fluid dynamics is limited due to their expensive evaluation. Tabulation methods help to overcome this limitation. We propose in this work a tabulation approach for real equations of state that is also suitable for multi-component flows and multi-phase flows with phase transition based on the homogeneous equilibrium method. The tabulation method is based on piecewise polynomials and allows adaptive refinement in state space, a local variation of the degree of the polynomials and even cut-cells to represent saturation lines. A detailed analysis of the benefits of the chosen tabulation approach is provided showing results of benchmark problems for nitrogen under sub- and trans-critical conditions. The tables are used in numerical simulations based on the finite volume approach. To provide reference solutions, an exact Riemann solver is constructed for the tabulated real EOS. Several numerical flux calculations based on approximate Riemann solutions and flux vector splitting approaches are modified for the tabulated equation of state. 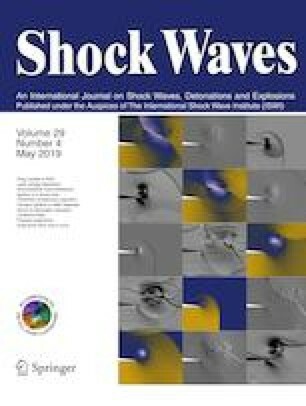 Besides the comparison for benchmark problems, two applications are depicted, a shock–bubble interaction and an injection of a trans-critical jet, which demonstrate the applicability of this approach to more complex flow simulations. The work was supported by the German Research Foundation (DFG) through SFB TRR 40 “Technological Foundations for the Design of Thermally and Mechanically Highly Loaded Components of Future Space Transportation Systems,” SFB TRR 75 “Droplet Dynamics under Extreme Ambient Conditions,” and GRK 2160/1 “Droplet Interaction Technologies.” The simulations were performed on the national supercomputer Cray XC40 (Hazel Hen) at the High Performance Computing Center Stuttgart (HLRS) under the Grant No. hpcmphas/44084. M.D. also acknowledges funding via the European Union’s Horizon 2020 Research and Innovation Programme under the Project ExaHyPE, Grant No. 671698 (call FETHPC-1-2014), and financial support from the Italian Ministry of Education, University and Research (MIUR) in the frame of the Departments of Excellence Initiative 2018–2022 attributed to DICAM of the University of Trento.